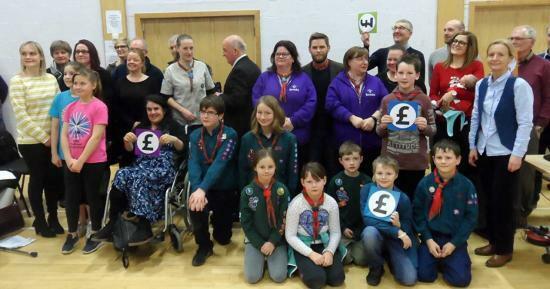 On Saturday 26th January 2019 the Your Cash Your Caithness event was held in front of packed auditorium at the Pulteney Centre in Wick. Once again 22 Caithness community groups made presentations with questions from the audience about their many and varied projects listed below. What was evident from the 5th event to disburse some funding with a public vote was the huge variety and commitment of the people who run groups in the county. The amounts being bid for were the tips of many icebergs. From a £10,000 pot only around 12 groups could get some cash. The audience member were allowed 5 votes each to choose form 22 groups making a request with a 3 minute speech. 12 winners were announced by Alex Macmanus the Caithness Wards manager who introduced Donna Manson the new chief executive of Highland Council to say a few words. After congratulating the groups on their presentations and success she surprised everyone by saying she was so impress that she was going to arrange more funding to ensure every single group got an award. She was meeting with Caithness councillor on Monday to discuss the details of how this could be arranged. Every single group had a an idea or wish to make thing happen for their members and the wider community. Virtually all of them had targets to raise more money for their projects. Some were looking for a few hundreds and one or two millions. All showed ambition and determination to achieve some really wonderful projects. It was inspiring to listen to the presentations and people were very impressed and proud to see what can be done by volunteers in all manner of spheres across Caithness. Well done everyone. The listing showing the ones the audience selected in the vote. But in view of the late announcement all the groups will be funded. It was great to hear about all of the projects. Congratulations to all the volunteers.